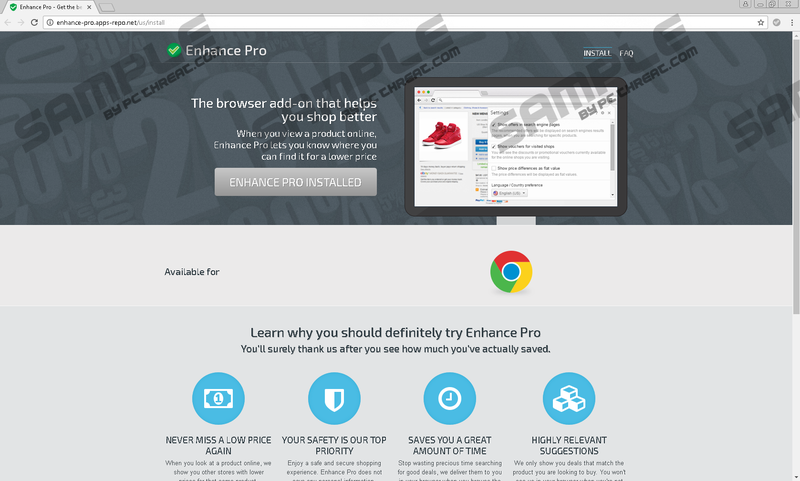 Enhance Pro is an application that will definitely not enhance anything on your computer apart from the number of third-party advertisements you may see popping up while you are browsing online shops. The operations of this software is not only annoying, you may also put your virtual reality at risk if you leave it on your system. In fact, this Google Chrome browser extension is an ad-supported program that can display potentially harmful third-party ads instead of trustworthy best deal offers as it claims. Our research shows that this malware infection is very similar to other adware programs, such as ShopzyApp and Price Wagon. Since this adware can show up on your system along with other malware threats, it is advisable not to remove Enhance Pro alone but you should also detect and eliminate all other possibly harmful programs. You can find two main official channels through which you can directly install this questionable browser extension. First, the promotional page at enhance-pro.apps-repo.net/us/install and second, the Chrome web store at chrome.google.com/webstore/detail/enhance-pro/nodbpfnfhjfkgnkddkjmnnljafobgaed. But before you are lead to believe that just because an application has its own official webpage and it is available in the web store it is a reliable or useful product, we must tell you that it is not necessarily so. In fact, cyber criminals can set up a fake product page any time and also promote their unreliable tool via the web store, which hosts them until they are reported malicious or potentially harmful. However, it is not too likely that most users have got infected with this adware through these channels. As a matter of fact, we have found that this malware infection is mainly spreading through suspicious and malicious websites, such as shopmania.ro, file-sharing pages (torrent and shareware sites), and online gaming pages. These sites usually promote a number of questionable third-party ads, which can be risky to click on since you may drop a single infection or even a bundle of malware threats. This is how it is possible that you infect your computer with several adware programs, Trojans, browser hijackers, fake alerts, and potentially unwanted programs. So, if you do not want to let such threats on board, you should only use reputable pages to download free programs. In addition to that, you should also refrain from clicking on random third-party ads. In fact, some of these ads do not even look like commercials as they are disguised as buttons or system notifications. We suggest that after you delete Enhance Pro you also look for a reliable malware scanner to scan your system to see how badly it has been infiltrated by other malware infections. This adware is nothing unique indeed since we have seen dozens of similar extensions emerging on the web pretending to be useful applications to save you money and time while shopping online. However, as we have noticed, this extension tends to show unreliable third-party ads from time to time and it is also possible that you will find questionable best offers that might lead to malicious websites. These ads may also take a lot of space from your screen, which can be very annoying, let alone distracting. If you click on unreliable ads, it is always possible that you end up on fake or malicious websites, or you simply drop some more infections onto your system. You may also open questionable pages on new tabs or new windows if you click on these alleged best offers or other third-party ads that keep popping up. Since it is possible that you end up, for example, on a fake online shop site where you could be asked to enter your banking details and you would not actually buy any product for real, we advise you to remove Enhance Pro right away unless you want to see your bank account drained by crooks. It is not too difficult to eliminate this adware since it is practically a browser extension that only works in your Google Chrome browser. While it could be enough for you to remove this extension, we suggest that you reset your browser instead because this may take care of other potentially risky applications as well you are not familiar with the steps necessary to reset your Chrome browser, please follow our instructions below. Do not forget that this will only take care of this particular infection and may be other Chrome-related ones. If you stop at this stage, you have not done everything in order to secure your PC. Therefore we recommend that you download and install a trustworthy security program, such as an anti-malware application and you use it to automatically take care of all security-related issues on board. Of course, even if you install such software, you need to make sure that you keep all your programs and drivers (Java and Flash) up-to-date because this can make your PC less vulnerable to malicious attacks and cyber criminals. Tap Alt+F to open the menu. Quick & tested solution for Enhance Pro removal.